It is the striped case decorated with the bow. But the true highlight of this item is the embroidered picture of little fairy: you can see her close up at the second part of photo. She has long hair, funny pink skirt with polka dot small bag on her shoulder and spectacular transparent wings which make her look like a butterfly. Girls will definitely like this Little Fairy gold hair embroidery design. This is nice and practical leather cover made by Leather Idea. It is suitable for protection your passport from any damages or stains. You also may use same idea for bigger things such as tablet PC or books. 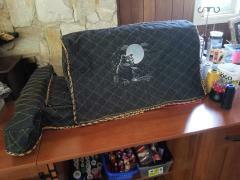 This cool work piece is decorated with Fox looks at the sky embroidery design. This is really very amazing picture. Its beauty is based on complex ornament and bright color scheme. Author Sue Robertson Very effective design of dandelions from which the head of a panther looks. If you have torn jeans, such embroidery will not only beautify them, but also eliminate the tearing of the fabric. 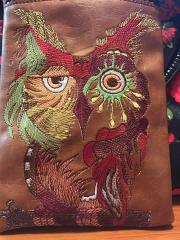 It is also very impressive this embroidery looks on bags, jackets, backpacks. To realize such a non-standard embroidery project, consider the features of machine embroidery on the skin. Many embroiderers think that embroidering on leather or leatherette is an impossible task. In fact, everything is not as difficult as it seems at first glance. First, materials such as leather and skin replacement do not forgive mistakes. That is, if you have already made a needle puncture, it is impossible to remove it. It will not drag on and will not disappear by itself, as on other bases for embroidery. Secondly, before embroidery, it is recommended to duplicate the material with ordinary sewing non-woven fabric. Thirdly, it is necessary to remember that leather materials, like any other mani, are the size of thickness, softness. They also vary in density, weight and hardness. Therefore, you should take a responsible approach to the choice of material. For example, the softer and thinner the material, the easier it will be to seal it. Fourth, it is best to use a cut-off average density as a stabilizer. In some cases, the use of a detachable stabilizer is permitted. Fifth, it is recommended to wrap the hoop with soft material before stitching the material. It is also necessary to weaken them so that they leave behind traces. An excellent option would be to use magnets x hoop, if any. Finally, reduce the embroidery speed to reduce the load on the embroidery machine. It will also help. prevent skipping stitches. On a black leather background. Machine embroidery design dandelions in zippers will look incredible. This idea is great for creating an original gift for friends, family and acquaintances. There is original set made by Ann-kristin Kristoffersen. It consists of four embroidered tubes made from dense quilted fabric. Each of them is decorated with different pictures of cute cartoon animas. They are Adorable kitten embroidery design, Cat sings Christmas carols embroidery design and others. Every work piece also has convenient handle which allows to hang it. Use it to keep little necessary things or to pack holiday gifts for your friends. This is nice holiday composition which definitely deserves to be Christmas post card. It includes pretty little cushion with figure of Santa Claus, nice metal candlestick which reminds lace and convenient leather case for tablet PC or other thing. It is decorated with Red Christmas gift box free embroidery design. It is quite easy picture which is making with just one color of thread. There is convenient textile case made from pretty fabric with delicate shine. It is executed in traditional Christmas color scheme and decorated with suitable sample. It is Snowman with glass champagne free embroidery design. There is portrait of merry snowman which is ready to celebrate winter holiday. It is made with just one color so it is easy enough even for beginners in embroidery. This is handmade embroidered case which can be used for keeping glasses or sunglasses. It is executed from smooth light leather with simple but very pretty decoration. 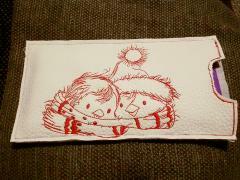 It is thin border on whole perimeter and Penguin's Christmas time embroidery design 4. It is portrait of two funny penguins made with just one color thread. They are wearing one scarf but look very happy. This is original and amazing textile cover which can be used as case for book or tablet PC. Its front side is richly decorated with interesting sample. It is Sketch female face free machine embroidery design added by geometric ornament on contrast background. Due to this unusual combination entire work piece looks like portrait of moon looking from night sky. This is pretty multifunctional textile case. You can use it to protect your smartphone or glasses from any damages. It is executed in beautiful Christmas style. It is underlined by Redwork Christmas ball free machine embroidery design and amazing fabric with delicate shine. Furthermore its lining is made from funny textile with Christmas deer. This work piece is prepared by Johanna Hasselbrink. This is cool quilted case for sewing machine which is convenient things for protecting it from dirt and stylish accessory at same time. Its dark fabric serves as perfect background for embroidery sample chosen for this work piece. It is Panther in the night free machine embroidery design. Wild animal on this picture seems to be lying at glade in forest at night. Here you may see photo of pretty and original case for glasses or other accessories. It is executed at interesting natural background which underlines pretty picture used for this work piece. 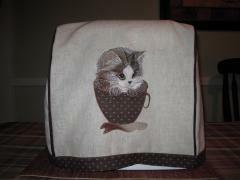 It is Cute kitten free machine embroidery design. On this image fluffy kitty seems to be looking at something interesting on its right. Case is added with convenient zip lock. 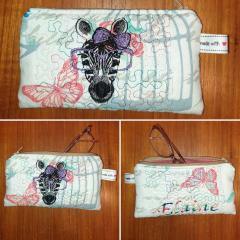 This is convenient textile case which is suitable for keeping glasses, pencils or any other things you want. It is added by durable zip lock which ensures safety of your belongings. One of its sides is decorated by Cute kitten free machine embroidery design. This picture is used in original way: it seems that curious kitty is trying to see other side of case. 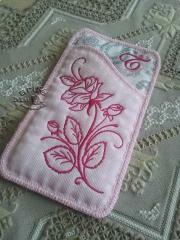 This is pretty embroidered case for smart phone or tablet PC executed in romantic style. It is made in gentle pink shades and decorated with floral ornament. It is based on Rose one color free machine embroidery design. It is quite simple picture which can be made even by beginner. This theme is supported by floral motive on linen fabric. This is practical and convenient case which can be used both for dioptric and sunglasses. Here you can see example of usage of this work piece. Its front side is decorated with Glass barcode free machine embroidery design. This thematic sample is one of best solutions for such accessory. Please note the interesting color accents of it: zip and one detail of embroidery has same bright color. This is nice textile case which is suitable for keeping glasses, pens or something like this. It has contrast zip and quilted ornament on its body. Central part of this work piece is decorated with Look at my polka dot dress embroidery design. It shows figure of pretty girl who is happy to demonstrate her new dress with beautiful ornament. This is nice leather work piece which can be used as practical cover for notepad, tablet PC or even document. To protect its content it has convenient rubber holder. Its front side is decorated with Indian skull machine embroidery design. This original design makes you look at this picture twice. Firstly it seems that it is usual face of Indian in traditional headwear, but then you found it is skull.